MakLoc Buildings strives to not only be an industry leader in fabrication and construction, but to also provide an amazing work environment for all our staff. Whether you are in one of our offices, shops, or out in the field, our success starts with the hardworking and talented professionals that make up our team. MakLoc Buildings offers a wide range of opportunities, with our offices and shops in Nisku, Morinville, and Calgary providing opportunities throughout Alberta. We provide a dynamic working environment, a wide range of career options and significant ongoing advancement potential. 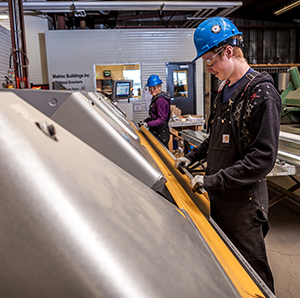 MakLoc Buildings is accepting resumes for Apprentice Welders, Fitters, and Laborer’s in Nisku. If you are interested in these positions, click here to find out more! MakLoc Buildings is accepting resumes for a Machine Operator/Millwright to be based out of our Nisku shop. If you are interested in this position, click here to find out more! MakLoc Buildings is accepting resumes for a Supply Chain Manager to be based out of our Nisku office. Reporting to the VP General Manager, you would contribute to the growth of the company by maximizing revenue, margins, and profitability by creating key vendor relationships. If you are interested in this position, click here to find out more! MakLoc Buildings is accepting resumes for a Weld Shop Manager to be based out of our Nisku office to manage our Nisku and Morinville welding facilities. Reporting to the VP Production & Engineering, you would oversee all daily operations of the weld shops from production and manufacturing to ensuring policies and procedures are followed. If you are interested in this position, click here to find out more! MakLoc Buildings follows a full design build process, and different career opportunities are opening up throughout the entire process. From the weld shop floor to the drafting room, we have a position waiting to be filled by you!